Caption: 24 hour quantitative precipitation estimates from radar across Scotland for Storm Frank (29th – 30th December 2015). Typical catchment average rainfall exceeded 80 mm in 24 hours for the Upper Dee, with some point estimates of 150 mm. All background radar data © Met Office. The past two months have brought significant rainfall across much of Scotland resulting in some severe disruption due to the impacts of flooding. Impacts have been seen in early December with Storm Desmond, through to Storm Frank which brought major flooding along the Dee Valley in Northern Scotland. 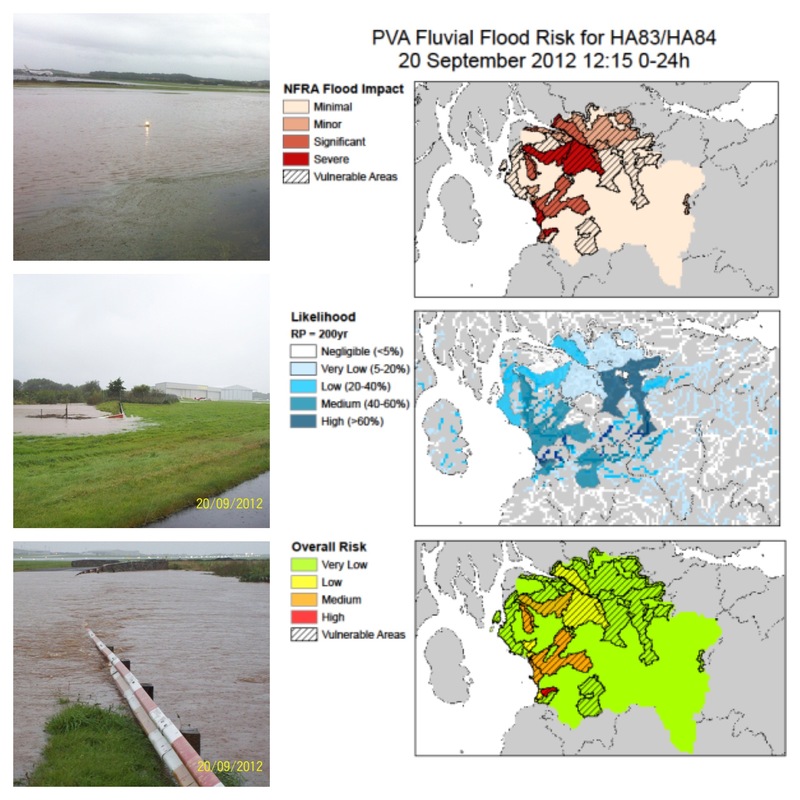 The use of radar is essential to increase our understanding of the spatial representation and real time estimation of rainfall for flood forecasting across Scotland. However, whilst this is a vital tool there are some unique challenges with doing so in Scotland not least the effects of the upland environment and distance from the radar. To this end the flood forecasting service are working with the National Centre for Atmospheric Science (NCAS) and the University of Leeds to deploy a mobile X-band radar to research the use of high resolution radar measurements for improved flood forecasting. The RAINS project (Radar Applications In Northern Scotland) will run from January to July 2016 and will be making detailed measurements of the atmosphere from a radar based in Kinloss, Morayshire, specifically looking to measure clouds and rainfall as they form across Northern Scotland. The NCAS radar is capable of measuring clouds and precipitation in high detail and is the only one of its type in the United Kingdom. The mobile X Band radar deployed at Kinloss Barracks in Moray (left) and initial quantitative precipitation estimates on the 2nd February (right) when flooding occurred across Ross-shire. 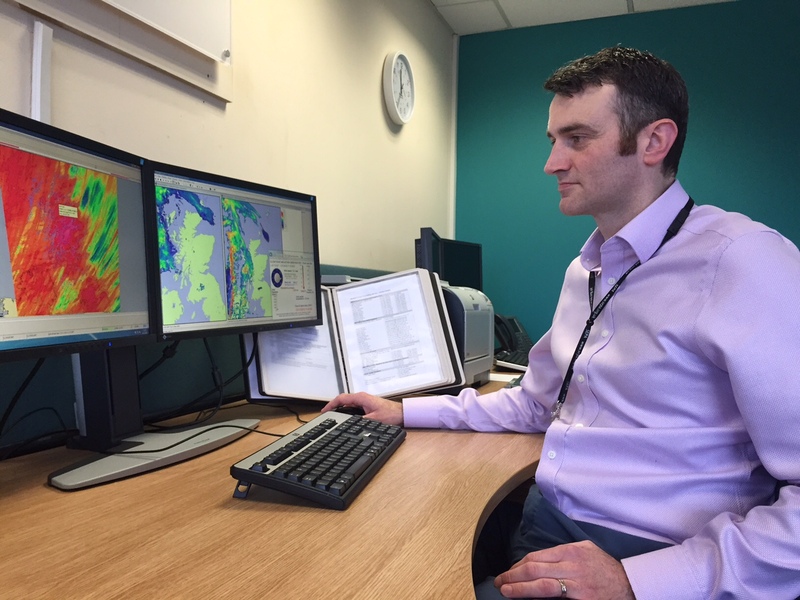 The collaborative project involving the Met Office and Scottish Water will specifically look to improve the understanding of rainfall and the prediction of floods through comparative hydrometeorological modelling using the quantitative precipitation estimates of rainfall generated by the Kinloss radar. Over the weekend of 5 – 6 December 2015 Storm Desmond – the fourth UK named storm of the winter season – brought damaging winds and heavy rain across Scotland, which experienced its most severe flood event since the advent of the forecasting service nearly 5 years ago. Impacts were widespread, and particularly severe in the southern Borders area. We issued our first ever Flood Guidance Statement containing a red (high) risk area, and also issued the first severe flood warnings since the service began. This is the first of two articles looking at the Desmond flooding. This article looks at the forecasting for this event; the second one will look at how this compared with a similar event in 2005. Exceptional rainfall totals were recorded in a 48hour period from the 4th to the 6th of December as its associated weather fronts wriggled southward across Scotland and northern England. 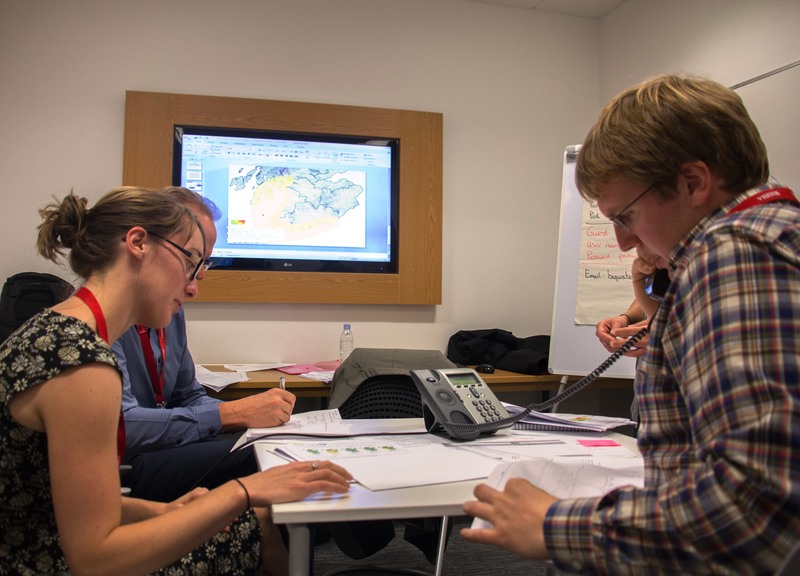 Forecasters at the Met Office Aberdeen watched the developments of Desmond closely. The ground was already saturated after a wet and gloomy November – so the challenge was to predict as accurately as possible the intensity and distribution of the rainfall. Forecast models tend to provide more reliable guidance for the distribution of rainfall that is dynamic (frontal) rather than locally generated (e.g. thundery showers). It was recognised at an early stage that the system would have a moist ‘river’ or ‘conveyer’ of winds ahead of the cold front. It was also important to consider the orographic enhancement of rainfall totals over windward mountain ranges. Whilst the frontal structure of Desmond was complex, the initial weather predictions supported the view that the cold weather front would clear southward into England; and that the primary rainfall totals would be associated with the leading weather fronts. As Desmond moved towards Iceland, subsequent weather calculations indicated a trend to a slower and more erratic clearance of the cold front southward over the weekend. Then finally; the cold front almost became stationary across the Borders, as further weather disturbances ran along it bringing further pulses of heavy rain. 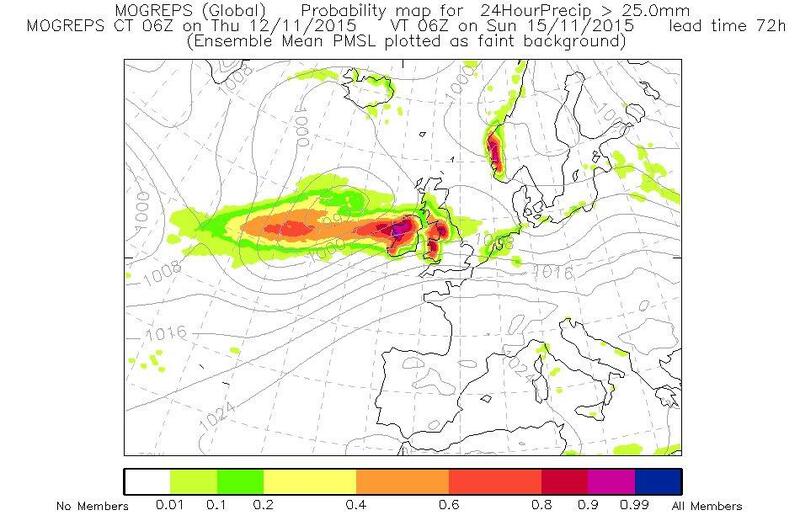 The greater persistence and intensity of the moist conveyor, as well as the slower clearance of the dynamic rain associated with the cold front – lead to the prediction of exceptional rainfall accumulations across NW England and the Scottish Borders. 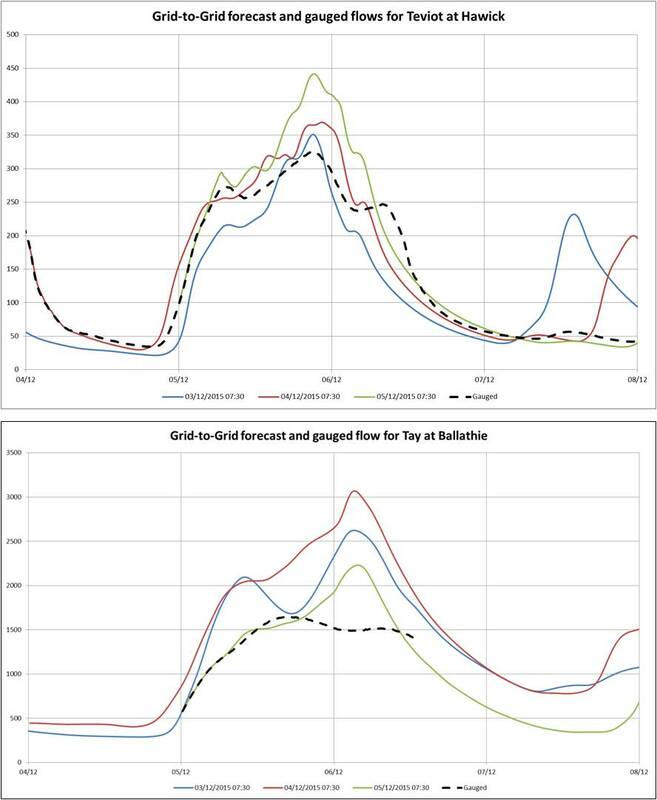 High flows were forecast throughout Scotland, as can be seen on the Grid-to-Grid (G2G) river flow model spatial plot, below. The widespread and prolonged nature of the expected rainfall meant that almost unprecendented quantities of run off were expected. Of particular concern were the Scottish Borders and Tayside, the G2G forecasts for which can be seen below. The forecasts for Hawick in particular were very consistent from two days before the event and closely matched what did occur. The forecast flows were comparable with those experienced in the extreme event of 2005, when there was extensive property flooding. The river Tay forecasts, whilst showing quite a range, all consistently indicated an expected flow approaching at least as great as that seen during the flood event of 2005, and possibly even the event of 1993, which was the largest in recent history. In the event it is clear that the model overestimated the Tay flows somewhat, possibly due to the non-inclusion of hydro schemes upstream which may have attenuated the peak of the flow. 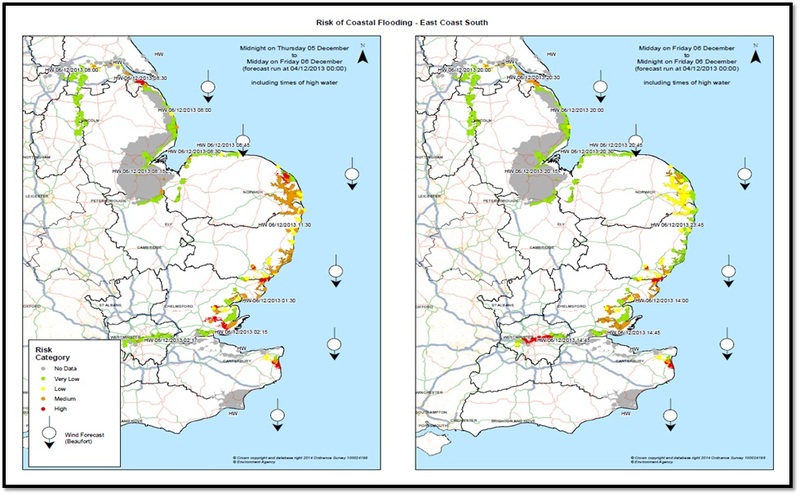 The heightened flood risk for the weekend was first signalled on the Flood Guidance Statement on Thursday, with a very low likelihood of significant impacts indicated. As confidence increased, on Friday the likelihood was increased to high, giving amber status to a large part of the country. Weather forecast models and G2G were giving consistent forecasts of very high rainfall totals and exceptional river flows. During Saturday it became clear that areas of the Scottish Borders, particularly Hawick and Newcastleton, were expected to experience severe impacts. These areas are not very far from the parts of northern England that were also going through extreme conditions. A large amount of rainfall fell across Scotland from Friday through to Sunday. As can be seen below, the main areas affected in Scotland were the Borders and the centre of the country (Tayside area) plus the north west. The impacts of this event were considerable. 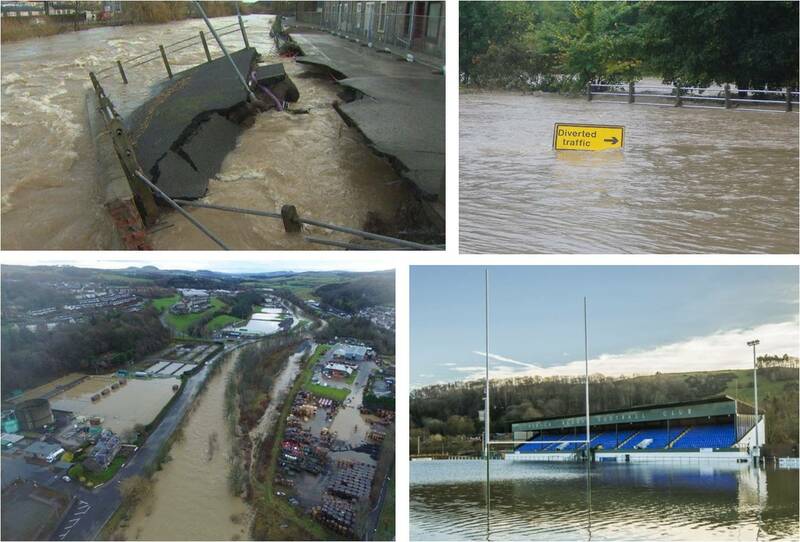 15 flood alerts, 75 flood warnings and 2 severe flood warnings were issued across the country. Over 150 properties were flooded in Hawick and other locations across the country. Significant travel disruption occurred. 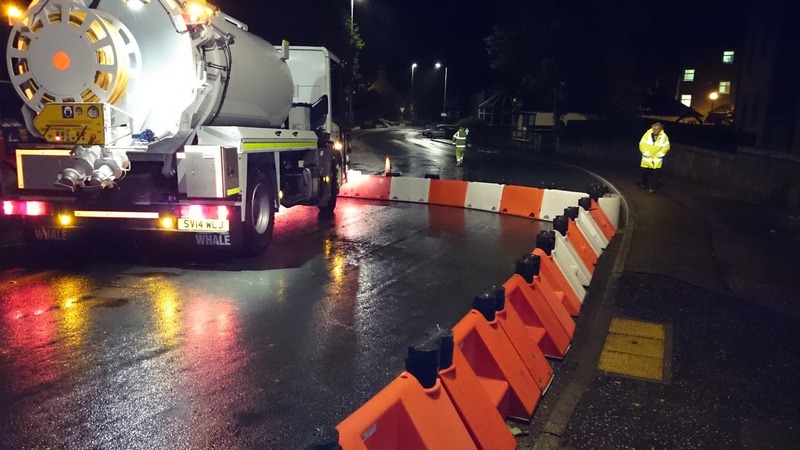 The Perth flood defence scheme was activated, entailing the closure of the main town bridge. Several railway lines were closed. Travel impacts were also exacerbated by the (unrelated) recent closure of the Forth Road Bridge for emergency maintenance. 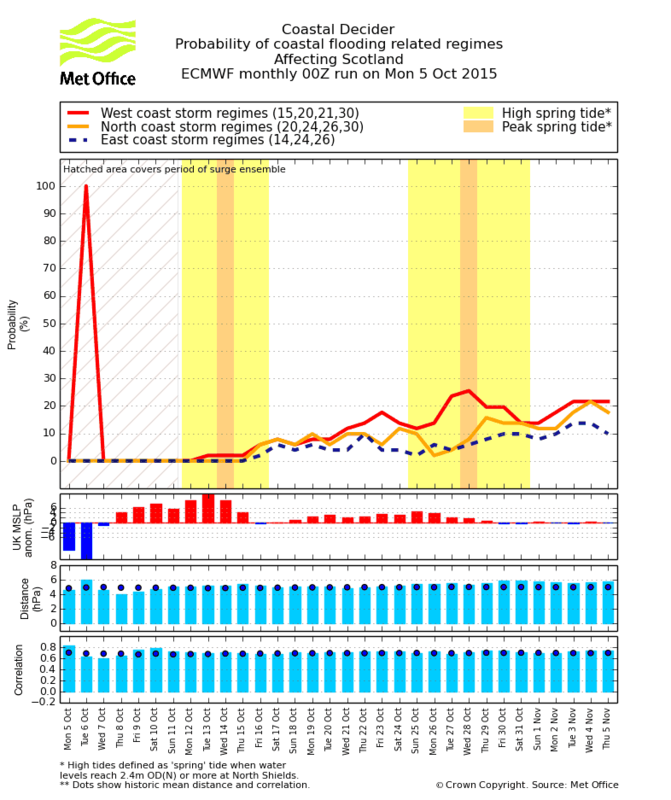 This event proved a major challenge for the forecasting service. For the first time we had to decide on issuing a Flood Guidance Statement with an area on high (red) status. We also input to the decision to issue two severe flood warnings, also an unprecedented situation. Rainfall predictions, particularly the UKV 36 hour high resolution forecasts, proved to be very reliable for the most part. G2G forecasts were invaluable. They were particularly in demand for locations where no local model currently exists, and for lead times longer than that used for local models. Timely forecasts and warnings enabled mitigating actions to be taken. 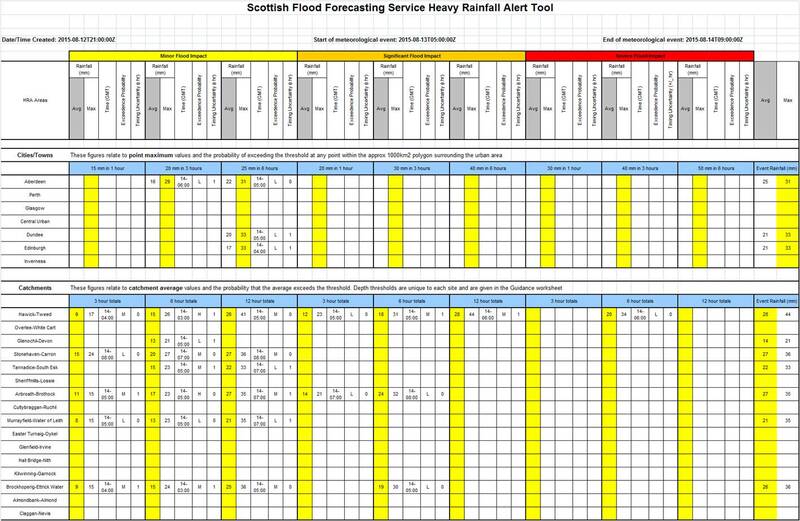 As will be shown in the next blog, improvements in forecasting and warning have led to a much improved outcome since the last time we saw this magnitude of flooding in Scotland. Nikéh Booister presents the second and final part of this series on decision making in times of uncertainty. As part of her M.Sc. thesis research in Flood Risk Management Nikéh did a part of her research in SEPA. The research focussed on decision making under uncertainty with an outlook on improving decision making based on the cost-loss method. 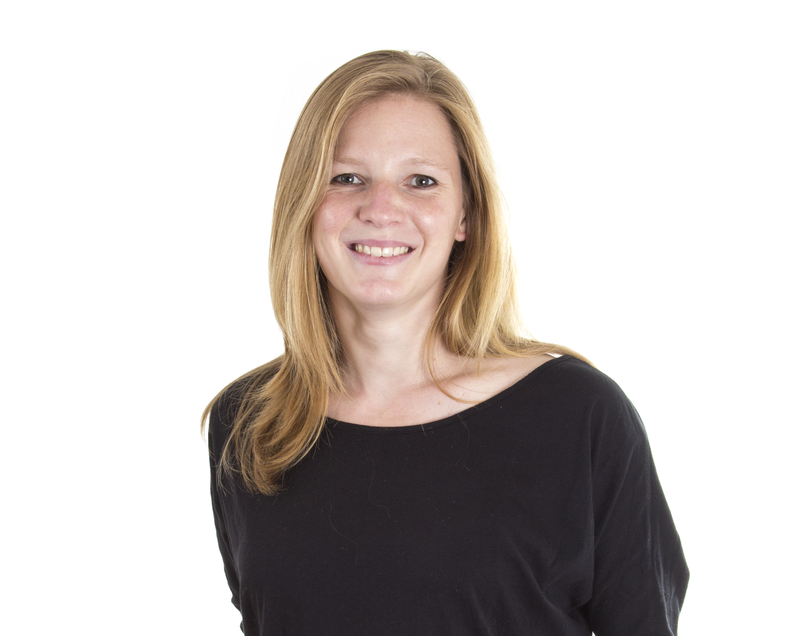 Nikéh continues working in the field of Flood Risk Management with her company FloodCom. “The forecaster has to be the expert on knowing what uncertainties are and where they come from as we could have read in the previous post. The forecaster has to decide on what is relevant and not and to a certain extent already has to make a decision on the quantification of the uncertainty. Whether or not a forecaster understands and interprets correctly the uncertainty, the decision maker has a final call and responsibility to “pull a trigger” for action. Currently most of the forecasts are presented in a deterministic way, which means a single valued number of a possible future. A part of the uncertainty is presented in a description of the future system state, nevertheless this is not quantified. A possibility is to present a forecast in a probabilistic way, where uncertainties are presented. 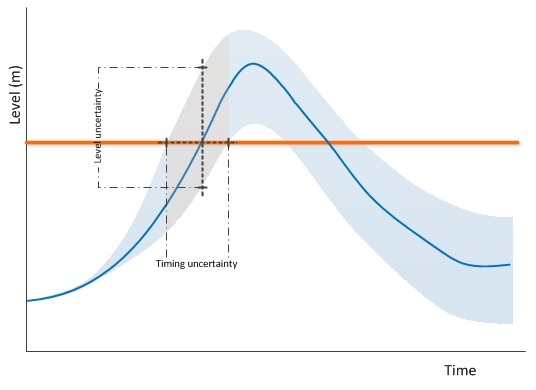 As mentioned in the blogpost of Paul Ryles; longer lead time makes the prediction of a future situation more challenging; the rate of uncertainty is higher. Probabilistic forecasts indicate possible future outcomes of a system and give the decision maker and responder more possibilities of responding (or at least the consideration of responding and with this more time to respond). This makes it possible to respond earlier in time and make decisions with a lower regret. Making a decision based on a deterministic forecast seems easier because it presents a binary solution (yes or no decisions). Nevertheless research has proven that decision making based on a probabilistic forecast gives better results (Ramos et al. 2013). When decision makers are introduced to the problem of uncertainty in forecasting it can appear to be too much; too complicated; and out of the scope of the decision maker to respond properly to this. This interacts with the fact that the decision makers and responders are the ones that have to deal with for example the uncertainty of citizen response. Thus, the responsibility is bigger. When a wrong decision is made, there is a threat of a “crying wolf” principle. Despite the efforts, there will always be dissatisfaction with the decision taken or damage occurred. And so, someone to be blamed. When a decision is based on a deterministic one, it is the model or the forecast to be blamed and not the decision maker – which makes the situation more acceptable. The ultimate question in forecasting and decision making is who is responsible in the end? And who is to blame in the case of a wrong decision being taken? Don’t we all try as hard as possible? There are approaches that provide an ‘answer’ and provide the forecaster or the decision maker with a decision making perspective, but when we would like to provide the decision maker with a longer lead-time, as mentioned above, probabilistic forecast might be the solution. In order to avoid blaming of the decision maker; a decision making tool or method needs to be in place to support the decision. One of these methods is the cost-loss method. This method compares the probability of an event to occur with the cost of certain mitigation measures and the losses that they avoid. Although it presents a solution method, it seems too static in time and due to its economic point of view, does not take into account intangible effects.